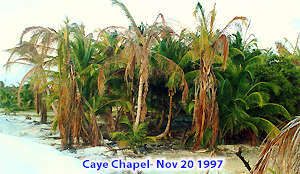 Lethal yellowing of coconut palms was first detected in northern Belize in 1992. Since then, it has destroyed more than 95% of the tall coconut palms in Corozal, has moved to Orange Walk and has caused serious losses in the Belize District. 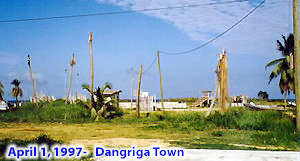 Since its detection in Stann Creek a year ago, it has infected a great portion of the susceptible palms in Dangriga Town and its outskirts. It is estimated that around 50% of the tall coconut palms in Belize have been infected by the lethal yellowing and its spread is considered rapid. 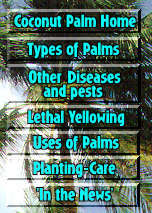 Lethal yellowing is a fatal disease of coconut and other palms that has killed millions of palms in the Caribbean region over the past 40 years. The disease has swept through the coconut growing regions of Jamaica, Cuba, the Cayman Islands and Florida, and is presently destroying palms in the Yucatan Peninsula, Honduras as well as in Belize. The disease is caused by a small bacteria-like organism called a phytoplasma and is spread by small plant-sucking insects known as plant-hoppers. There is no effective cure for the disease and the palm will die within 3 to 6 months after the appearance of the first symptoms. The first visible sign that a coconut has been infected is the dropping of all of its fruit, irrespective of their size. Over the next two months or so, the new flowers produced by the palm wither and blacken. Then the leaves progressively turn yellow and hang, starting from the lower leaves and finishing with the top leaves. Once the top leaves have gone, the palm is dead and all which is left is something resembling a telephone pole. The disease occurs in discrete areas known as foci. These foci slowly grow larger, gradually taking in more palms. Once lethal yellowing becomes established in an area, most of the coconut palms will die within the next 3 years. The disease may also jump over several kilometers to establish new foci. Even though there is no cure for lethal yellowing, the disease can be effectively controlled by trunk injections of the antibiotic palm formula every 3 1/2 to 4 months. Costs range from $BZ 12-14 per treatment on Ambergris Caye. This Oxytetracycline based formula was originally tested and proven by the University of Florida in conjunction with Phizer pharmaceuticals and the State of Florida's Dept of Agriculture. The long-term solution to the problem is to plant resistant coconut varieties and palm species. It is recommended to use the two control methods in conjunction so as to keep the old coconut palms alive until the new resistant ones have grown up sufficiently. 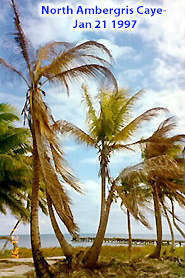 For the replanting of coconut palms, two varieties are currently recommended: Malayan Dwarfs and Maypan (or Mapan) hybrids. The Dwarf palms grow very slowly and won't form tall graceful stands of coconuts for some 40 years but seeds taken from these palms should breed true-to-type and can be used for replanting purposes. The alternative is to plant the faster-growing Maypan Hybrids. This variety is produced in special seed-gardens by crossing the highly-resistant Malayan Dwarf variety with the medium-resistant Panama Tall variety. Since these hybrids are special crosses, they can only be bought from limited suppliers, are relatively expensive, and do not breed true to type as they are hybrids. Contact Chris Berlin for more information on the availability of the Maypans in Belize. 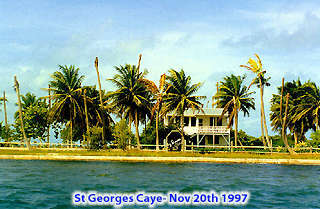 Middle Caye and Long Caye at Glover's reef are highly infected. 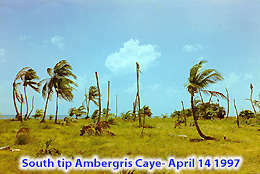 note: The least resistant palm is the Atlantic which makes up a good 99% of the coconut palms on the cayes.